This blog recently featured Tom Seaver breaking the record for consecutive 200-strikeout seasons, a record he later stretched to nine (1975 OPC #5 profile). 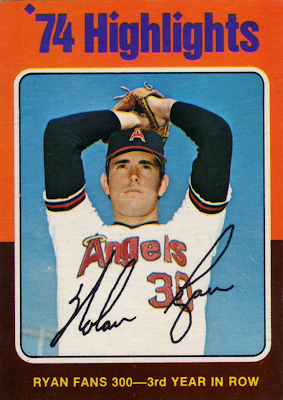 Nolan Ryan would've tied this mark if not for 1975, when injuries limited him to 28 starts and 186 K's. The Express and his 100mph fastball otherwise dominated 1970s hitters, fanning 300+ five times and leading the AL seven seasons total. 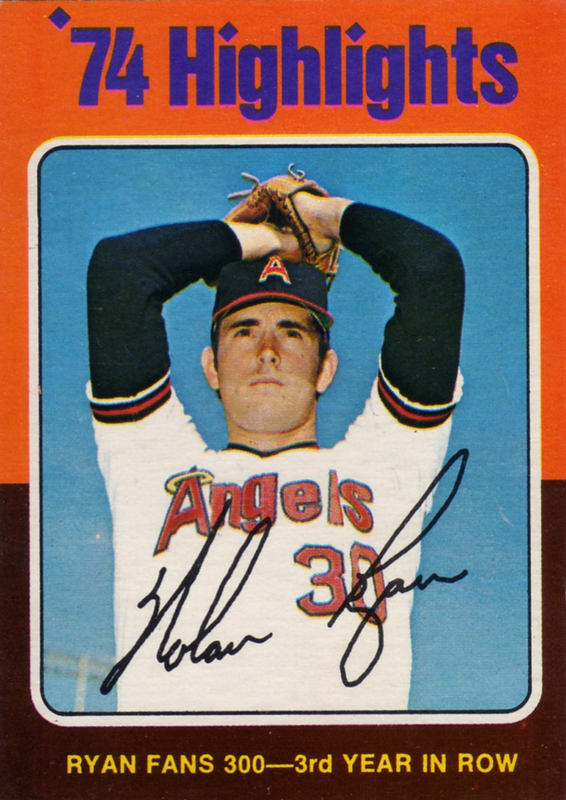 After a few years off league leader boards in Houston, Nolan moved to Texas (Rangers) and captured four more AL strikeout titles, all after the age of 40. 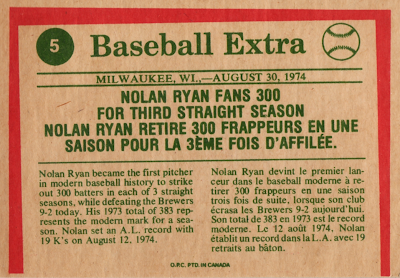 This durability also pushed Ryan well over 300 wins, despite playing for mostly mediocre teams. (He never led the league in victories or won a playoff series after 1969, thanks to top-notch competition like Jim Palmer / Catfish Hunter in the AL and Tom Seaver / Steve Carlton in the NL). O-Pee-Chee matched Topps' 1975 checklist card-for-card, but printed backs in bilingual English-French and added the "O.P.C. PTD IN CANADA" tagline. 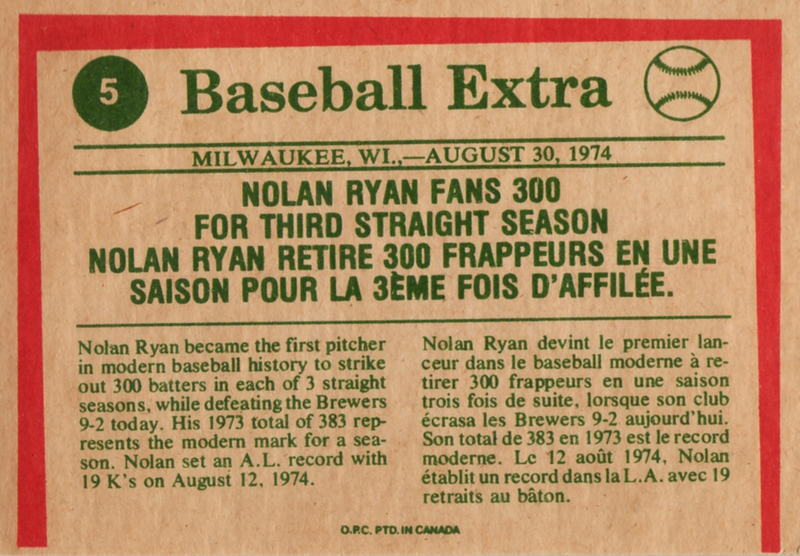 Record breakers like Ryan (#1 to #6) frame their tilted "newspaper" against its red background--that's not a printing mis-cut, though plenty of cards also suffer that ignominy. Value: Ryan's one of the few superstars that retained decent value after the card market crash. This OPC #5 cost me $10 on eBay in 2007. Fakes / reprints: Haven't seen any OPC reprints in the market, though Topps likely reused this image for one of their throwback sets.